Located in Cancun (Avenida Kukulkan), Arts Party Central Hostel - Adults Only is minutes from Plaza Caracol Mall and Caracol Beach. 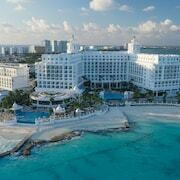 This hostel is within close proximity of Cancun Convention Center and Forum By The Sea Mall. Make yourself at home in one of the 8 air-conditioned guestrooms. Complimentary wireless Internet access is available to keep you connected. Conveniences include desks, housekeeping is provided daily, and irons/ironing boards can be requested. Take advantage of recreational opportunities offered, including a spa tub, a fitness center, and bicycles to rent. Additional features at this hostel include complimentary wireless Internet access, a television in a common area, and tour/ticket assistance.